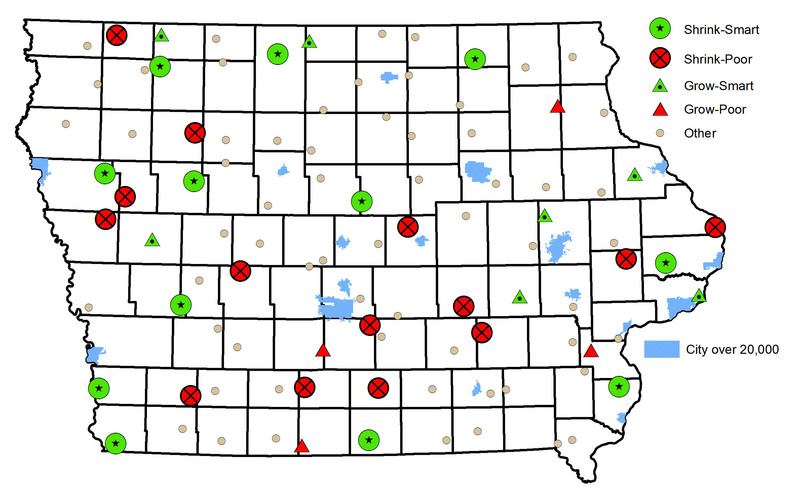 This map shows the locations of 12 Iowa towns, marked by stars inside green circles, determined to be “shrink-smart.” Image courtesy of David Peters. Larger image. AMES, Iowa – You can still live large in a small town. A new report from an Iowa State University sociologist identifies a dozen Iowa towns where residents believe quality of life in their community is improving at the same time the population is shrinking. David Peters, an associate professor of sociology and author of the report, said these towns, described in the report as “shrink-smart” communities, show that a smaller population doesn’t necessarily denote a withering community. Peters drew on U.S. census data as well as responses from the Iowa Small Town Poll, a regular ISU survey of rural Iowa communities currently led by Peters. He compared changes in population with survey data regarding attitudes toward jobs, local government, schools, medical services, housing, childcare services and elderly care. The report looked at small towns with populations between 500 and 10,000 with populations that declined between 1994 and 2014. The survey data showed 12 Iowa towns fitting those parameters where citizens reported improved quality of life at the same time the populations decreased. What did those 12 towns have in common? Peters said the survey results showed a focus on social interactions within those communities. The towns labeled shrink-smart in the report demonstrate high levels of local involvement, such as volunteering in community organizations. Peters called this “bridging social capital,” a sociology term describing diverse and inclusive networks that tie residents together across demographic and economic lines. He also noted that economic factors, such as income and poverty rates, were not significantly different from the 12 shrink-smart towns and towns that showed declining quality of life and shrinking populations, a result that surprised Peters. He said the results in the report may empower rural communities across the state because the data show that social interactions playing a major role in attitudes regarding quality of life can be improved quickly and cheaply. Peters said some communities view population declines as a major problem that can be solved only through major investments in infrastructure or by attracting new employers. His report suggests encouraging a more open and welcoming atmosphere in a community may go a long way toward boosting quality of life, regardless of potentially expensive new investments. The data also showed shrink-smart towns tended to demonstrate growth in “goods-producing” jobs such as construction and manufacturing. These jobs provide good wages and benefits while also requiring some training or education beyond high school but not a college degree, a fit for the labor markets of rural Iowa communities, Peters said. Peters said he and his research collaborators intend to work with officials in the 12 shrink-smart towns identified in his report to determine what strategies the communities implemented regarding community involvement and quality of life. From there, they hope to formulate best practices that can be transferred to other rural towns across the state. Peters’ research is part of a National Science Foundation project on shrink-smart towns led by Kimberly Zarecor, associate professor of architecture and principal investigator on the project. Other research faculty on the project are Sara Hamideh, assistant professor of community and regional planning; Eric Rozier, assistant professor of computer science, and Marwan Ghandour of Louisiana State University. A new report from an Iowa State University sociologist looks at Iowa towns that have improved quality of life while populations have dwindled. The report draws on census and survey data to identify 12 “shrink-smart” communities in Iowa.